RhodesMRC 2018 will be the 9th Edition of the Rhodes Model Regional Co-operation, a conference simulating the works of regional international organizations. Growing from 2 committees and 50 participants in 2010 to 2 separate conferences with a total of 12 committees and 550+ participants for 2017, RhodesMRC was always about being innovate, expanding, including everyone in. Till today more than 1600 young students and professionals from 25 countries have visited Rhodes in autumn to have an amazing academic experience, develop their skills, entagle in a benefiting intercultural exchange, in one of the most amazing heritage backdrops available. Learn more for RhodesMRC's long history, its academic innovations and its various distinctions. For its 6th Edition, the High School Edition of RhodesMRC 2018 has been designed with specific targets in mind: 1. Maximize the possible number of participants, 2. Further diversify its set of simulated organizations, 3. Make the simulated organization more relevant. With 4 committees this year's conference will have 160 seats for member states and 50 seats for observer states to its offerings, aiming to exceed the 120 participants mark set in 2017. 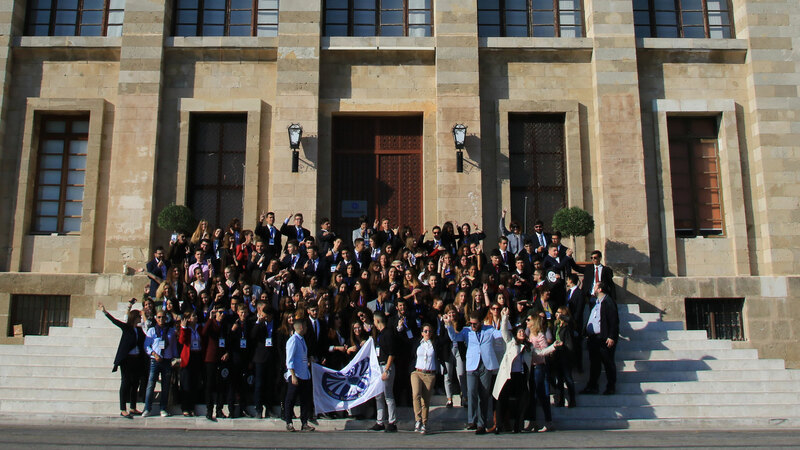 The Council of Europe remains the flagpole of the conference, as human rights, democracy and education should and will be in any agenda addressed to young students of pre-adult age. The European Council of the European Union to our simulated organizations, further expands the experience with the most integrated example of regional co-operation ever existed, and also one that most of our participants can relate to, as they come from countries that either are members of EU or have strong ties with it. The Our Planet Summit will get young students as involved as possible to their future. Modeled out of ad hoc summits, like One Planet Summit or the UN Environment Summits, the young diplomats will have to decide on their own future and the survival of our planet as green and blue as we know it. The Organizing Committee of RhodesMRC is assisted by Mrs Evangelia Moula, in charge of School Activities for the Directorate of Secondary Education of Dodecanese. The prestigious Scientific Committee of RhodesMRC also oversees the preparation and works of the High School Edition, securing high academic value and a challenging simulation. The Board of RhodesMRC 2018 – High School Edition comprises from highly skilled university students, with vast experience in simulation conferences and a Secretariat that comprises from some of the top MUN executives in Greece.